There are people out there who manufacture money from nothing. Literally. The rest of the world has to earn it, but some are in it from the start–where money is created from the ether. Banking is not a secret but no one tells you how it works… it’s hard to get your head around it, but if everyone understood, some aspects would be outlawed tomorrow (just like they used to be). Greens and bankers make strange bedfellows. The bankers know where the Greens are coming from, but the Greens need to find out why bankers, “the paper aristocracy”, are so keen to save the planet. It’s an unholy alliance. This is the US Money Base graph. Base money is cash and reserves at the central bank. It’s a graph to stop you in your tracks, starting from 1918 and going up to this week. It took 90 years to grow the US money base up to about 800 billion dollars, then in four months from August 2008 it doubled. This is the parlous state of our “managed” paper currencies. Just as one fiat system collapses, some people want to set up another. In a free market economy the one price of the most important, most central item is fixed by a group of bureaucrats we don’t elect. The price of money. That’s the interest we have to pay to those who made our sovereign dollars from nothing. Carbon credits are a fiat currency, the market will have the same players and similar rules: governments decree everyone must pay tax in dollars and… trade in carbon credits. The units are worthless without government backing. It’s a “free market” but at the point of a gun. There is no box on purchases where you can opt out from sending some money to men in dark suits based in London and New York. The vested interests are already massive. Last year alone $126 billion dollars was traded in carbon markets according to the World Bank. Projections are in the trillions. Literally. It will be the largest commodity market in the world–which is all the more ironic given that there is no commodity to back it– we don’t trade carbon, we trade the right to air that could have had more carbon in it. The coulda-had-carbon-market just doesn’t have the same ring. David Evans has written up a paper that describes just what kind of Octopus we are dealing with, and it’s bigger and more insidious than almost anything you can imagine. It’s a long paper, but if you are not aware of how our currencies are created out of thin air, backed by nothing, and why the Global Financial Crisis was not a surprise to those of us watching the money supply, then stand back, hold onto your hats and take a deep breath. It’s like living in The Matrix. Modern money is paper, manufactured by banks out of thin air. Banks make something from nothing. This is the story of the rise and abuse of that great power, a high-level view of the current financial bubble and its causes and consequences. Modern money is created by debt. The growth of the bubble is tracked by the ratio of debt (money) to GDP (size of the economy). It started at its normal level of 150% in 1982. By 1987 it had reached 235%, the previous record set in 1929 on the eve of the Great Depression. By 2007 it had soared to 340%, and by mid 2009 it was 375%—nearly 20% of GDP is now spent on interest. There is now scarcely any more disposable income for taking on yet more debt. We are hitting the wall. 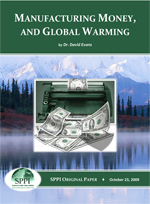 The newest game by the banks is carbon emissions trading. The plan is to manufacture emission credit certificates out of thin air, trade them between big financial companies, and compel the rest of us pay for them by producing real goods and services. The new financial slavery. Carbon emission permits are the latest paper currency, brought to you by the same crowd who profited from the world’s largest financial bubble. Same structure, same modus operandi, same beneficiaries, same use of exaggerations, half-truths, and tricky government statistics. Banks want carbon trading. They do not make a profit from a carbon tax, which would be fairer and simpler. Governments are not offering a carbon tax, only cap and trade. Ever wondered why? 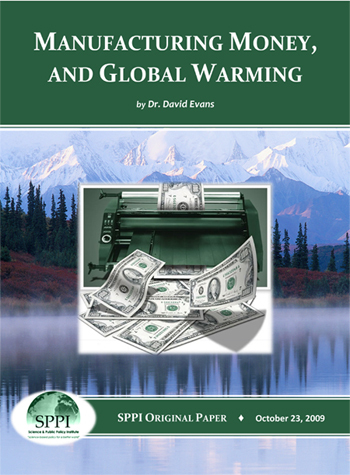 Read the full Science and Public Policy Institute original paper Manufacturing Money, and Global Warming by Dr David Evans. This is a story that has been years in the making. You can get updates of the money base (and all other monetary aggregrates) at the St Louis Federal Reserve web site. I wrote a shorter synopsis of carbon as a fiat currency in February. The corruption is inevitable: Carbon casino caught with it’s pants down.